Indonesian-born Iko Uwais may not be a household name yet, but he’s breaking down boundaries as quickly as his characters break bones. 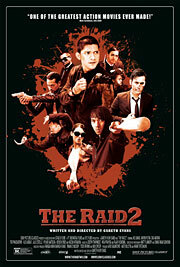 Action fans were blown away by his starring role as Rama in the 2011 martial arts extravaganza “The Raid: Redemption,” where he played a naïve cop fighting against a corrupt boss. In the meantime, he also paired with another martial arts icon in last year’s “Man of Tai Chi,” directed by and co-starring Keanu Reeves. This week, he returns in one of the most awaited sequels of the year (sorry, Cap) in “The Raid 2,” written and directed by his good friend, Gareth Evans. He recently sat down to discuss working with Reeves, his relationship with Evans, as well as bringing appreciation of his martial art form, pencak silat, to audiences around the globe. BULLZ-EYE: How did you go about improving as an actor from your time in the original “Raid”? IKO UWAIS: I learned a lot, especially from Gareth, because he knows the characters and the role. I took it into my heart, integrated everything and I played along. It happened naturally after that. BULLZ-EYE: How does the Indonesian martial arts differ from other styles? IKO UWAIS The basic moves are the same. The difference is that there are many types of pencak silat, Indonesian martial arts in Indonesia. From pencak silat alone, there are many different schools. Thousands of schools. In choreographing for this movie, I combined some moves from different schools. IKO UWAIS: I can’t explain, because I was really happy. I was happy to work with him. He was very wise. He was very friendly and he also directed the movie. He always told me what he wanted. Usually, there’s a relationship between the director and the actors. He approached the actors. BULLZ-EYE: The fighting in the film is as breathtaking as it is violent. Does pencak silat also stress a spiritual side as well? IKO UWAIS: Yes, absolutely. In pencak silat, especially, the spiritual aspect is very dominant.